In discussion the other week, the topic of what they should fix with Myki came up. You know, ignoring the imagined problems. But first I want to mention the known bugs… that is, leaving aside “by-design” flaws and issues such as bus/tram incorrect zone detection hopefully likely to be resolved by the end of Myki’s headless mode. Myki Pass Retail Console Bug. There’s a bug in the retail consoles which means that if your Myki card (which has a four year lifespan) expires in less than a year, you can’t buy a Pass of any duration. So you might have 300 days left until the card expires, but you can’t even buy a 7 day Pass. This does not affect Myki vending machines; it’s unclear if it’s an issue with railway station booking office equipment. Free weekend travel — not quite free. If you have a Zone 1 Pass, then travel in zone 2 on weekends and public holidays is free. That’s because to calculate your fare, it uses the Weekend Daily Cap (currently $3.50) but subtracts the two-hour fare of the Pass (also currently $3.50) making it zero extra cost. But the bug is in the way this calculation is done at touch-on and touch-off. It turns out if the Myki Money balance is zero, it won’t allow you to touch-off in zone 2 (eg having touched-on and travelled from zone 1) — and presumably will also stop you touching-on in zone 2 as well. Preventing you touching-on outside your Pass zone is perhaps understandable, but stopping you touching-off when the system knows a zero fare is chargeable is clearly a bug. Fixed 1/1/2014 — touch-on (and presumably touch-off) is now possible with a zero balance. Zone overlap travel followed by zone 1 travel. The scenario: Use Myki Money, and make a trip first in the zone 1/2 overlap (charged at the cheaper zone 2 fare, $2.42), then after the initial 2-hour fare has passed, make a trip in zone 1 ($3.50), then after another 2-hours has passed make a third trip in zone 1 ($3.50). You should pay the Daily Zone 1 cap ($7.00), because all of your travel has been within zone 1. But you actually get charged a Zone 2 2-hour fare, plus the Daily Zone 1 cap (a total of $10.50). This bug was first found back in 2010. As far as I know it hasn’t yet been fully resolved, though I seem to recall they now do scans of the database to find and reimburse people who have made this combination of travel. None of these three bugs are likely to affect the majority of people, but neither are they completely obscure. Update 10/4/2013: Last week a bug with overlapping Passes emerged; sometimes a second Pass loaded onto a card may activate before the first Pass has expired. Details here. faster touch times — as discussed previously, Myki is noticeably slower than Perth and Brisbane’s systems. I’m guessing this wouldn’t be easy to fix, but would make a huge difference. short term tickets (printed like receipts, as is done in Brisbane and Perth), even if Daily is the only option. Price them as high as you like, but have them available. remove the multiple cards detected error if the second card isn’t a Myki — should be as simple as checking the card type flags and/or card number ranges. This would make it easier to use your Myki card from a wallet or handbag. make the minimum balance for touch-on be zero (instead of above zero) if a valid fare product for the touch-on zone is on the card — currently for instance to use a $3.50 weekend fare you have to load a little more onto the card so the balance stays above zero. This is counter-intuitive. Great list. A shame no one in the transport system cares, as long as they can blame someone else. * Regarding: “faster touch times”. Yes, but not for myki gates. The barrier attendants will tell you to WAIT until the person in front of you has completely cleared the barrier before you present your card. Otherwise, you can’t be sure that YOUR card has activated the gate. * myki money machines should stop displaying “insert card” and “remove card” at the same time on two different parts of the machine display. @Rodger – I’ve always found that you can get through the gates quicker if you don’t wait for the person in front to completely clear. 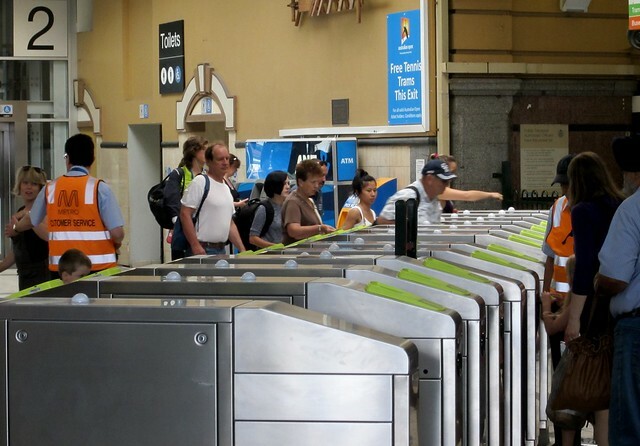 Especially with myki gates, it’s easy to tell if it’s your own card being recognised because the reader instantly reverts to “Please touch your card below” when the person in front removes there own card from the reader. The gates are also usually quick to respond in that situation, simply closing and immediately opening again when the person ahead clears the sensors. I’m not sure if myki readers suffer congestion, but I’ve noticed they tend to respond quicker out of peak, although they seem to be quicker overall now than they did a year or so ago. Sorry, Roger, I misspelt your name. That daily cap Zone 1/2 bug is pretty nasty; should also be pretty straightforward to fix — there are only so many combinations to solve for. And the scanning hack stuck on top… Well, at least they’re doing something. In most cases except yearlies, passes probably get enough of a discount. To buy the same 33 days on myki money would cost $203; the pass provides a 45% discount on these fares. The discount on ‘working days’ is about 35%. Passes have benefits including ‘just travel’, not having to touch off, etc. However, there’s also the risk of having a pass and not having to travel – e.g. not travelling on public transport both weekend days, or every single working day (sick and holiday leave). Yearly passes probably don’t provide enough of a discount to reflect these risks – the discount is in the same ballpark as monthlies, after you subtract 4 weeks of leave (which probably accounts for some travel on leave, and no travel on sick days). And you’ve got to pay up front, losing the 5% you would have earned on the money if it was sitting in your home loan or savings account. Agree with fixing all the other flaws! Daniel, can you please expand on “consider scrapping 7-day pass and replacing with 7-day cap”? I’m not clear on the difference between them. I did some googling but am none the wiser. @Bonnie – Canberra run something like this on their “MyWay” card. Basically if you use your myki in any rolling 7-day window up to the cost of a weekly (so $35 for a zone 1 full fare), the rest of the 7 days is free. This would normally happen on a Friday if you started Monday, so effectively you’d get free weekend travel – without having to purchase or worry about passes, etc. Thanks, @Dave. This sounds like a good idea, and one they could have added to the “publicise good things about Myki” list if they decided to implement it. I wonder why they scrapped it. @Daniel – Good work putting this all in one place, it clearly highlights many of the important problems with myki. Hopefully the list will get worked through eventually, but I’d be placing bets on some of the more important problems (i.e. multiple cards detected and slow response times) never getting fixed. @Bonnie – I’d say it was simply a matter of reducing the scope once they realised they had promised more than they could deliver on the project, i.e. it got put in the too hard basket. Total = $168 an approximate 28% discount, if people travel every single day for 28 days, which would only be a minority of users. Some people may need to drive into work a few times a month and will rarely use PT on weekends; these users are unlikely to think a monthly is worth it. On top of this, monthly fares actually encourage more use of the system as each extra ride is a “freebie”, this is precisely why pass fares should be reduced. I suspect one reason it wasn’t implemented is they couldn’t figure out how to do a rolling 7-days – it may have been limited to Monday to Sunday only, and the fare structure at the time (5+ years ago) meant that some people buying a Weekly for say Wednesday to Tuesday travel would have paid more. They probably didn’t want to have a Weekly Cap and a Weekly Pass running at the same time; it’d be too confusing. They may have also decided to stick more strictly to the Metcard fare structure. @Julian, a lot of people use a 33-day Pass because it can start on a Monday and end on a Friday 5 weeks later. Then you load another 33-day Pass and start that on the following Monday. This is of benefit for people who only use PT from Mon-Fri, as they don’t pay for the intervening weekend. With planning ahead, you can also tweak it to avoid public holidays, or (assuming you won’t want to use PT) annual leave. Again, being able to more flexibly buy 28+ day Passes instead of only by calendar month is a benefit of Myki over Metcard which hasn’t been promoted. The reason for Dave’s “theory” of buying a 33 day pass, is that it somehow maximises the value for the weekday user. If you bought a 28 day or a 35 day pass, you’d be paying for either 4 or 5 full weeks. But if you buy a 33-day pass, you avoid paying for one of the weekends, you save two day’s cost at whatever the daily rate of buying a pass is, and still get your five weeks of weekday travel. This “theory” makes sense for people who don’t travel at weekends anyway. It doesn’t make sense for people who regularly travel on weekends, unless you can somehow ensure that you never need to travel on every 5th weekend. A 12-day pass would make even better sense, but you can’t get one. On the education side of things, I can’t believe they haven’t been actively promoting the message that you don’t need to touch off on trams. I’ve heard a couple of the soon-to-be-phased-out myki mates mention it, but beyond that nothing. They changed the whole zone fare structure on trams to address the issue of touching off delays (and SOOO many people are trying to touch off now) but don’t have as much as a recorded message or sign on a tram. The 33-day pass makes sense even if you do travel on the intervening weekend – weekend saver prices ($3.50) is still cheaper than per-day pass prices ($4.30). So either way, you maximise value by getting the benefit of pass prices for weekdays, and weekend saver fares on weekends. If you bought a 28 or 35 day pass (4-5 calendar weeks) you’re paying $4.30 per day, every day… versus 4.56 weekday, and 3.50 weekend. So you overpay by about 80c per weekend day, assuming you even travel on the weekend at all, in which case you’re overpaying by nearly $10 each weekend. (I suspect most people on passes use PT on the weekend sometimes, but not every day every weekend, unlike work days). This is pretty much why buying passes longer than 33 days has diminishing benefit, as per my comment about yearlies above. The zone overlap bug was fixed last time I tested it in October http://themykiuser.blogspot.com.au/2012/10/myki-may-no-longer-be-ripping-you-off.html . Of course it may have re-emerged or possibly still happens on buses and trams, which are much harder to test on purpose. I also haven’t tested it on weekdays, but I think the same calculations apply. Agree about the weekly cap, that would be great, and would also make buying a pass less confusing if the only option was 28 day and above. @Nathan, thanks. I think I’d want to see it tested on a weekday, as it may well be that the system only didn’t charge you more because you’d hit the weekend cap. I’m one of those weirdos that always tries to touch off, even on trams. The two main reasons are: to suppress the annoying warning notices that pop up every next touch-on, and to make the transaction list (slightly) easier to read. Both of these make my ‘easy and cheap to fix’ list, but I expect that Myki has reached the ‘good enough’ stage in the mind of project owners and will never actually progress any further. My cynicism tells me that the current round of maintenance updates is the minimum required to prevent intervention by financial/legal agencies, and it is the last change we will see in the next 10 years. I’ll be very happy to be proven wrong. It is probably not frequent commuters, but I have quite often noticed people delaying a tram by touching off before they leave a tram. I’ve also seen doors close on people while they attempt to touch off and they end up getting carried to the next stop. And peeps, if the Myki reader does not read your card in 0.01 seconds, moving it around or jiggling it won’t help. Just hold it still. Yes, the readers are too slow. 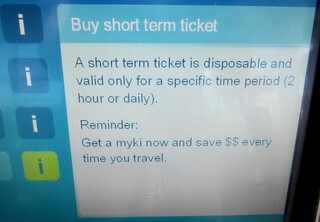 Showing the expiry time for myki money fares should be so simple. Years ago I requested the feature several times and was always advised by the phone operators that this was one of their most requested features. Fast forward several years and it’s still not there – even though the “it won’t show on a frankenbarrier anyway” excuse is no longer relevant. In my experience slow touch on/off is the worst thing about myki by a long shot. It affects 100% of users and is more than slightly irritating. Day after day I queue up at the station exit waiting for dozens of people ahead of me to touch off. Each person needs to hold their card against the reader for 1-2 secs, and that adds up to a lot of delay and frustration. It is supposed to work in a fraction of this time, like in other smart card cities. Do they care enough about this to fix it? On the spot replacement of faulty and expired cards at every staffed station, not just the PTV Hub at Southern Cross. Display of myki pass and myki card expiry date on screens should be the last full day on which the pass/card can be used, not the following day at 3am. If the screen says my pass expires on 31 January, it means 3am that day, so most people would think of it as expiring on 30 January and many will get caught out. @Dave – Thanks for the clarification, that makes a lot of sense and I guess is something else they could promote. Although, of course it doesn’t make sense for them to promote that too much. HA HA, the AFL-branded Myki cards was my idea. Glad you liked it Daniel. People pay $500 to put AFL branded number plates on their car, wouldnt some people also pay $50 to get a branded Myki card? PTV could learn a thing or two from VicRoads. I was alarmed a few weeks ago to read a news article in which one of the higher-ups, such as a boss of PTV or something like that, was quoted as saying Myki would be with us for another “five to ten years” so it was important that it was working properly. Would they seriously be considering a replacement after five years, when it has already taken nearly four years to start it up *after* building it? Not exactly a bug, but a feature that could be useful for pass holders is to eliminate the hard requirement to have touched on to be able to open a barrier gate. I got caught today running for the train, and my myki didn’t touch on properly (I did try, but I guess the 2 seconds I held it on the reader wasn’t enough). Consequently, gates wouldn’t open at my CBD station… even though I’m on a pass which is valid for travel. I got referred to an AO who basically said as much and waved me on. Some are Myki system defects and some are in the problem/customer management processes as deployed by Myki contractor Kamco (http://www.kamco.com.au/). * Myki transaction history on CVMs does not display amount of each transaction, only running balance. This makes it harder for consumer to quickly check if charges are correct. * For Carer Allowance recipients Myki system is unable to add Sunday Travel coding to existing Myki card thereby forcing purchase of a new correctly-encoded card. * If you have two Myki (Myki money) cards registered to you and use the first one which goes into negative balance during your first few hours of travel including tram where you can’t top-up , so you have to switch to the second Myki and end up paying two lots of daily capped fares then Myki has an official policy of not refunding the second (overcharge) daily cap fare. The system is unable to recognise that you were the traveller for both cards. * If you want to transfer unused Myki money balance from an old card to a new one, the call centre (run by Kamco – Myki contractor) may help you fill in the form over the phone and advise you it can all be done without sending the card in. Don’t believe them. You will eventually get an emal demanding that you send the card in. * When you report problems with Myki to the call centre, quite often they will not open a case# and may not even update the call history. So when you ring back on the same matter the next operator has no idea of the problem and no record on the computer of previous conversation. Be careful and make sure you write down any case number issued and date/time/names of staff you spoke with. * if you have not maintained your own list of case reference numbers, the Myki call centre is unable to provide you with a summary of the case numbers that have been raised against your account. There are more issues but this will do for a start. I’d like to see a list published of the managers and developers of Myki, so I can avoid ever having to work with any of them. @Joe To what degree is a person expected to take some responsibility and do some thinking with their public transport travel? Even I wouldn’t expect a card to send a reminder to tell me to apply for a concession card or acknowledge that I’d paid part of the fare on one of the cards in my online account and now that the balance is negative I want to use my other myki and only pay the difference and keep using the ticket… seems a bit much. A lot of parentsregister their kids’ myki cards in their online account. What if you could top up immediately but now your mothers myki thinks it’s using your 2hr tix so you have to pay for a new ticket anyway. @Roger If you touch on to a gate immediately after someone touched on and is passing through, it will remain open until it senses a second person passing through. I do this every morning! It’s much quicker now. I’m curious if the myki contract includes ability for something like a major change in the fare structure (eg more zones, a switch to distance based charging, or something like that). If the government decides for whatever reason to change the way we are charged in some manner (more than just putting up prices) do they get so many “free” changes under the contract, or would they need to pay extra? @Marcus – I agree that Yarra Trams ran quite an effective marketing campaign that seemed to get the message through – they just ended it before the last tranch of passengers shifted to Myki and were therefore receptive to the message (ie when Metcard was switched off). The PID messages haven’t been used at all since Dec 29 (not that I’ve seen, and I’ve been looking for them), and the stickers still exist, but not at eye level (they’re above the tram doors), and are lost with the visual clutter of other messages on trams (in my view, they should be placed next to the myki readers themselves). And definitely no on board announcements. The heavy duty marketing has all been about the end of metcard, but now that this has passed, they need to return to educating passengers on how to use myki. The often fruitless attempts of passengers to touch off on trams has spiked markedly since Dec 29, and I think it’s worse than it’s ever been. @Jackie 23/Jan – I’m sorry that you’ve misunderstood some points in my previous post. I wasn’t talking about reminders re a concession card, but the requirement that a special additional photo-id (VPT) is required to be purchased and carried as soon as a student turns 17. Some schools advise their students of this, a lot don’t. To ensure consistency, the Myki system should provide a one-time advisory to all students potentially affected by this scenario. Regarding the use of Myki Money and two Mykis, my point was not about splitting a fare between two myki cards but about Myki policies needing to recognise that a daily cap has been paid for by the traveller and allowing travel for the remainder of that specific day, irrespective of the card’s balance. The card would then be unusable for future travel until topped up. Thoughts? Still can hardly believe this could be the case. Needs to be more flexible than that! For now at least, this is compounded by Metcard validators which have not yet been removed from their much more sensible positions and at best only serve to assist those same slightly infirm halt themselves out of their seats. PTV and Yarra Trams’ number one priority should be to rotate as many trams as they can afford our of service for long enough to remove the Metcard validators and relocate the Myki validators to where they don’t obstruct passenger boarding (and disembarking). In regards to the minimum balance for touch-on … we should make the rule simple: Minimum balance: zero. That way there’d be no confusion about whether a fare product (which very few people would understand) or a pass applies to the card, or if an early bird applies, the list could go on. I suspect it would also simplify software design and the coding. And I’m really surprised that the Government didn’t take this option when free travel for seniors didn’t work – instead it spent $2 million adding 1c to thousands of cards. It would have been far cheaper to change the software to allow zero-balance travel. Before anyone else pipes up, I hardly think a 1c difference is going to lead to huge amounts of fraud. Just in case you’re wondering, Daniel, I’m also on the Myki Panel – currently documenting about 35 quirks of Myki (there’s an overlap of about 5 to your list here).